Another treadmill run this morning. Unlike my usual method where I start easy and then pick up speed, today I began with a fairly fast pace and kept it up until the end. My energy level was high throughout the workout, a good sign that my conditioning strategy is working. 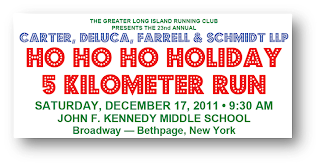 I've decided to sign up for the Ho Ho Ho Holiday Run that happens on Saturday, December 17, in Bethpage, NY. 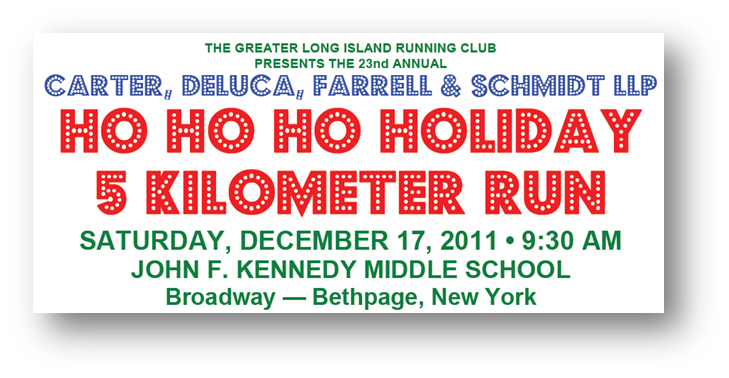 I really like holiday themed races because they reinforce the idea that racing, while competitive, is also fun. I have never done this race before (nor have I ever raced in December) so this will be a new experience. The date is a Saturday, which means I'll have still have most of the weekend to celebrate my (predicted) mid-pack finish. I think I can do this with you. For fun & a good cause.